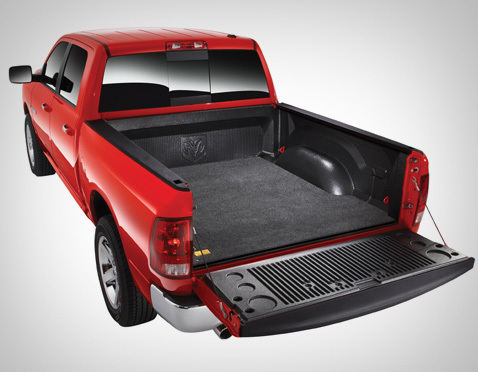 This BedRug Mat is designed expressly for trucks that are already equipped with a drop-in plastic liner, featuring a ½” thick foam backing that provides a smooth work surface without needing to drill holes into your truck bed. Much like the BedRug, the BedRug Mat is made to fit your specific make and model, and will give you the look and feel of carpet in an ultra-tough 100% polypropylene (essentially plastic) product. It will protect your truck while standing up to whatever you can throw at it: from mulch to bleach. With its cushioned foam non-skid surface, it will keep everything in place while protecting your cargo and your knees. The BedRug Mat material is fade and UV resistant. Made of foam similar to that used in life jackets, it doesn’t absorb water and will not mold or mildew. Just clean it with a hose, power washer or vacuum and your BedRug Mat is good as new.